This full moon with a lunar eclipse tossed in gives us the perfect opportunity to welcome a new Flower Essence combination remedy: The Red Tent. This remedy is the creation of staff goddess, Emily Dewey or EJ as she likes to be called. Not only did she create this gem of a combination Flower Essence, but she has written the following blog to share it with us all! Welcome to the Red Tent and thank you dear EJ for your beautiful creation that has already begun its work in the world. Without further ado, here is EJ’s blog! The conversation began at the farm, when one day in the office I found myself doubled over in pain on the first day of my period. Being stubborn to a fault, I hate using traditional painkillers. Instead I was trying slowly but surely to energetically ease the pain pulsing through my second chakra. One of my favorite parts of working at Green Hope Farm is that no conversation is off limits. All curiosities, musings or Divinely channeled thoughts are always welcome. Including, of course, talking about our periods. In astrology the moon represents our emotions, our deeper instincts. Connected to our Bodies, the 28 (or so) day cycle for a woman flows along in conjunction to the Moon’s. As we energetically connect to this waxing and waning within our own physical being, we may come to embody the same powerful energies the moon represents. The power of intuition and empathic or psychic abilities are all more deeply accessible during the time of bleeding. Historically a woman’s ability to shed and release so naturally was seen as mystical and incredibly powerful. While some cultures may have taken a slightly less enlightened approach through shaming women and calling them unclean (**cough**Book of Leviticus…), those cultures who recognized a Divine Feminine saw this process as deeply sacred and basically mind-blowing. How could a woman bleed that much and not die?! In Native American tribal traditions, the practice of Sweat Lodges, or Temezcal, was created by the elders to provide the men their own opportunity to have an experience similar to the cleansing and purification a woman was naturally able to do in her monthly cycle. Through a ceremonial sweat, the men were able to reemerge having intentionally let go and released any negative energies that had accumulated. In today’s world we have greatly lost touch with the power of the physical Body – on many levels. Especially for women, the task becomes recognizing the gifts our Bodies provide to us. Yes, INCLUDING periods! The reality is that we are always experiencing fluctuating energy as our Bodies move through the monthly cycle. The expectation to always “GO! GO! GO!” is completely illogical and fights against what nature is asking. Not to mention an obvious contributing factor to why women face their monthly cycle like a single person dreads the “So are you seeing anyone?” conversations at holiday family gatherings. As women, our monthly bleed is a time of deep cleansing – both physically and energetically. Research suggests that one of the reasons women may live longer is BECAUSE of our ability to cleanse the Body through our periods. When we are given the time and space to fully recognize the importance of this process, we are able to reemerge into our daily life post period more in tune, energized and better able to serve from our highest selves. It is known by many names in many cultures and spans back in time to societies in which women were revered for their innate power and wisdom. Moon Lodges, Menstrual Huts or Red Tents; the idea remains the same. It is in these sacred spaces where a woman is given the opportunity to slow down and rest during her cycle, to connect with her Body and the wisdom of her connection to the Divine, all with the intention of releasing through the natural and sometimes mystical, monthly physical process the Body undergoes. Awareness of the Red Tent was brought back into the mainstream by Anita Diamant’s book, The Red Tent, and a new movement has sprung up in response. Today’s Red Tents are a modern expression of such sacred spaces. These spaces are centered around reminding women to “put on your own oxygen mask first;” as self-care is the basic building block towards being able to energetically and physically show up as the caregivers we may naturally be inclined to embody in our day-to-day lives. In truth, when I step back and look at the receptive, nurturing space of working at the farm, I realize that we have created something close to our very own Red Tent to serve us throughout the cyclical experience of each of our lives. But we know that not all women are fortunate enough to have the experience of being able to surround themselves with community that easily holds space for the slowing down of energy, for the need to commune, reflect and process that which is being let go of each month. So that’s where our newest combination Essence comes into play! We are so excited to be able to offer The Red Tent Essence as a means of creating the energetic experience of your own sacred Moon Time space. Below is a brief explanation of each Essence that contributes to the unified energy of The Red Tent Essence. We hope that this new powerhouse provides you immeasurable support and love, encouragement to embrace the cyclical flow of your life, and reminds you of the sacred beauty of the female body and all her mysteries. Painkiller Plant – Because sometimes shedding layers hurts. A lot. In the last week there has been another rise in vibration on our planet. This is good news for Earth and all humanity, but sometimes complex in the immediate aftermath of the shift. Why is this so? These vibrational upticks require us to accommodate these vibrations in our physical bodies, and that requires effort on the part of our electrical systems. Flower Essences are all about helping our electrical systems tune up to higher vibrations so we can make these higher vibrations our own vibration. This means Flower Essences are a very helpful tool during these vibrational shifts. This last week many of you have been ordering Flower Essences for your eyesight. This particular energy rise does seem to have been challenging for our eyesight. Rosa Glauca is the one that has been flying off the shelves the most. Bottle Gentian and Eyebright are two others that are going out the door in a steady stream as they too are extremely supportive for eye concerns. For many it’s our head where we notice the higher vibrations first. If headaches, unusual memory glitches, or a general fuzziness in your head has been something you have noticed in the last week or two, it could be your sixth chakra adjusting to the new energies. Snapdragon, Grapefruit, Silverrod, Breathe, Lemon Balm are just some that might hold helpful information for this transition. We have also found that just about everyone needs Flower Essence support for frayed nerves right now- Sarah Van Fleet Rose, Feverfew, Outburst, Jewelweed, and Indian Pipe are just a few of the ones that have felt particularly supportive to you right now. Not surprisingly, I lean heavily on our combination remedy Flow Free during these kinds of energetic shifts, and I suggest it to just about everyone. I also try to keep very hydrated. Our work during these upticks is to keep the energies moving through us and to attune our systems to this new planetary vibration. Flow Free and being hydrated help with this task. As these shifts can leave us feeling very spaced out, our Grounding mix is another that is very helpful. Grounding is all about keeping us physically present and fully in our bodies. The marriage of holding the new vibrations in our electrical system and being fully present is the goal during these energy upticks. Doing this helps us and humanity tremendously. We have all heard the metaphor of how cleaning up our part of the pond affects the whole pond. There is deep healing change for ourselves and all creation that comes as we make manifest these beautiful high vibrations flooding into the planet to support us and lift us up. I know this can seem like a missive from a naïve Pollyanna. The surface news is dire with rising violence and incivility. However, great and good changes are afoot on this precious planet, and as each of us shine our love and light in the world, we are a part of these changes! Between hauling buckets of maple sap, stoking the fires of our maple sugaring evaporator and finishing off big pots of maple syrup in the kitchen, I’m warming up for the spring sprint of a million garden tasks AND some unusual summer projects as well. With all the uncertainties of our erratic climate, it’s not clear when spring will join us. Maybe tomorrow. Maybe a month from now. But I’m guessing sooner than later. While last year we still had a couple feet of snow on the ground on this day, this year it’s a whole different ball of wax. Not much snow all winter and now greening grass. In fact, it sounds like it may warm up so fast in the next week that our maple sugaring could come to a rapid end. For maple sugaring we need alternating cold nights below freezing and days in the high 30’s and 40’s. This up and down is necessary for the sap to run. This is because the sap only runs when it’s rising up past the buckets into the branches of the trees as the temperatures rise and then when it’s going down past the buckets on its return to the roots of the trees where it is stored in winter. When it gets warm and remains warm, the sap stays up in the trees and the tree begins to leaf out. Sugaring is over. That’s the theory anyways and one that the trees often disregard. I love how frequently on a day when it’s a bit brisk and doesn’t quite seem ideal for the sap to run, the sap buckets are brimming over. It’s equally interesting on a text book day for sap when the trees hardly run. Trees are alive with a mind of their own, and I love this! So today it sounds like it is going to soar into the 50’s and 60’s and then stay warm. I’m not entirely clear how fast this will end our sugaring for this season. It could end swiftly. 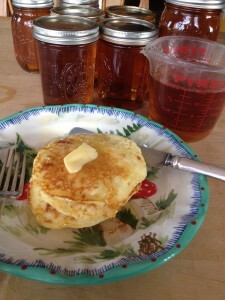 In any case, there will be plenty to do once the sugaring is over. I have pruned about half of our fruit trees and need to finish them before things really warm up. I also have started seed flats and have many, many more seeds to start in the next few weeks. This year I am starting an especially large amount of cut Flowers i.e. 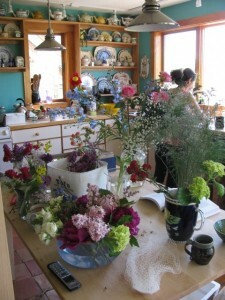 annual Flowers that make good Flowers in Flower arrangements. For those of you who remember that very, VERY thick notebook I had for organizing Elizabeth’s wedding in May of 2012- well…… the NOTEBOOK IS BACK. Emily is getting married in August to Charlie Carey. Their wedding is in Maine where they met and fell in love, and it’s quite a bit bigger than Elizabeth’s wedding. Like five times bigger. While many of the details will not be in my hands, I wanted to do the Flowers. Emily loves Flowers and Flowers love her. 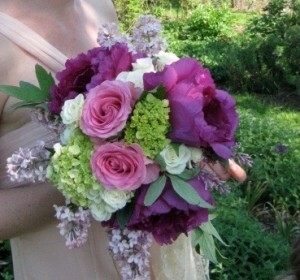 And I did the Flowers for Lizzie’s wedding and that went well. When I made the offer I wondered how complicated it could be to do a bigger wedding with a church, a formal reception, nine bridesmaids and a flower girl named Grace. Oh quite a bit more complicated. On the kitchen table there is fresh maple syrup for anyone brave enough to linger near me and my WEDDING FLOWERS NOTEBOOK. Everyone in the household knows it is best to eat and run, because the kitchen table has become COMMAND CENTER for my plans to grow a heck of a lot of cut Flowers. They didn’t know, and they don’t care. They just want to finish their pancakes in peace. And please, did I really have to pause the Downton Abbey finale a half dozen times to look at the floral arrangements? Thank goodness I can bore all of you with details here! In fact, no time like the present to set the stage. Here are some photos of our 2012 efforts. In the face of 10 bouquets, 20 table vases, arrangements at the church and boutineers/corsages for a cast of thousands these earlier efforts seem like amateur hour, but a sweet sort of amateur hour. Let’s hope I can pull it all off again in Maine! 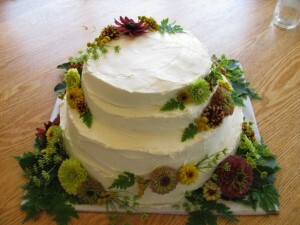 First a wedding cake I did but that I am not doing this time. I offered the baker of Emily and Charlie’s cake Flowers for her efforts, but even I could be talked off the ledge of doing the Flowers and the cake while also being the MOB. Our ridiculously low key Flower set up for the last wedding as we only had a couple bouquets to do. Note slave/friend/GHF staff goddess Catherine Boorady at the sink slaving away. I booked her for this wedding too, bless her brave soul. One more thought about the Downton Abbey finale. Preoccupied as I was by the Flower arrangements at Edith’s wedding, I could hardly give a hoot how things turned out for anyone upstairs or downstairs. So too, I now zero in ONLY on Flower arrangements in all photos. Here’s a photo of the bouquet from my last wedding bouquet effort. I think I was related to the bride but can’t quite remember- My head is too full with data about days to bloom, stem wraps and floral preservatives. How do you spell single-minded? I’d say you spell it FLOWERS.